Often, the success of court actions depends upon the effectiveness of provisional remedies, conservatory measures or summary judgments taken before or in lieu of the main proceedings. A good decision, obtained after years of effort, is of no use if it cannot be enforced because the debtor's assets have disappeared. This text provides a guide through the web of preliminary actions that can be taken in order to ensure the successful seizing of assets. This practical guide answers questions such as: what is a Mareva Injunction and how can it be used effectively? ; what is a refere, in France, Belgium and several other countries, and how can it save the plaintiff years of litigation? ; and how can assets be seized in Hong Kong on the basis of a German judgment concerning an Australian living in Turkey? Within each country, each topic is clarified using a comprehensive example, which allows the reader to see the theory in action. 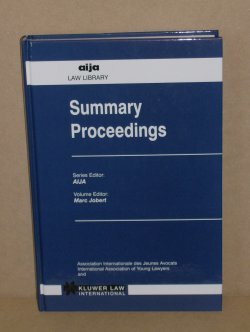 "Summary Proceedings" covers the following countries: Australia, Austria, Belgium, Brazil, Cameroon, Canada, Finland, France, Germany, Great Britain, Greece, The Netherlands, Hong Kong, Ireland, Israel, Italy, Korea, Luxembourg, Portugal, Sweden, Switzerland, Tunisia, Turkey and the USA. 411pp.